By: School Psychologist, Patrick Russell, M.S.Ed, Ed.S. I have four children with a pretty good space between numbers two and three (11 years). That space has allowed me to reflect on what is important in life and learn what I perhaps could do better. One thing that I have learned, and try really hard not to take for granted, is that time is extremely short between the moment God entrusts me with these precious lives to when they walk out the door on their way toward adult life. At no other time was this made clear as the day we were packing to move to our current home and my oldest son (child number two) was preparing to leave for college. He and I were going through some of his boxes, trying to determine what should stay and what should go, when we came across a model of an old pickup truck still un-assembled in its box. It was a model I had bought a number of years before so the two of us could sit down and have a fun activity together. Unfortunately, I got busy with other things and the model remained in pieces. As I looked at all of those small plastic parts I started to cry. I can be a rather big sap, and I’m pretty sure my son thought I was losing it. All I could think of was, I missed an opportunity to spend time with my young son. Now he’s leaving and it’s too late to ever get that opportunity back. I remember an article I read by Dr. Harley Rotbart, a pediatrician. He wrote, “There are only 940 Saturdays between a child’s birth and her leaving for college. If your child is 5 years old, 260 Saturdays are gone.” In the grand scheme of things, the time you have to spend with your young children is way too short, and the impact that time can have on your children is great. I still remember the times, as a very young boy, that my dad would spend hitting baseballs to me and teaching me how to play the game. He would make time to do this even after long days in the field, or on the road. I look at those all too short moments as some of the greatest treasures I possess. Not only did they teach me how important it is to be a father and to spend time with my children, they also showed me how much my father loved and cared for me. Research shows that when parents spend quality time with their children a much greater chance for emotional bonding exists. Children whose parents make time to engage in activities with them tend to perform better academically and are also less likely to engage in violence. Teenagers who frequently have dinner with their families are at lower risk for substance abuse. The funny thing is these activities don’t have to be an extravagantly planned out colossus of unfulfilled expectations. It could be playing in the yard, gardening, going for walks, watching television together, playing an age appropriate video game, or an old fashioned board game. Yesterday, I went for two walks, one with my 11-year-old son and one with my 13-year-old son. During my walk with my 11-year-old we talked about the high school basketball game we had just seen, how he would like to play basketball when he is in college, and about the bald eagle we saw circling above. My walk with my 13-year-old consisted of conversations about our family dog that excitedly pulling on her leash, the need for clean up along the creek we passed over, and some discussion about simply growing up. Making time for these walks required little more than 20 minutes each, did not cost any money, and did not require a degree in philosophy. However, the end results of both were priceless. Priceless because it showed my sons that they were important enough for me to take time out of the day for them, that they were important enough for me to listen to them, and that we could share not only time together, but thoughts and dreams as well. 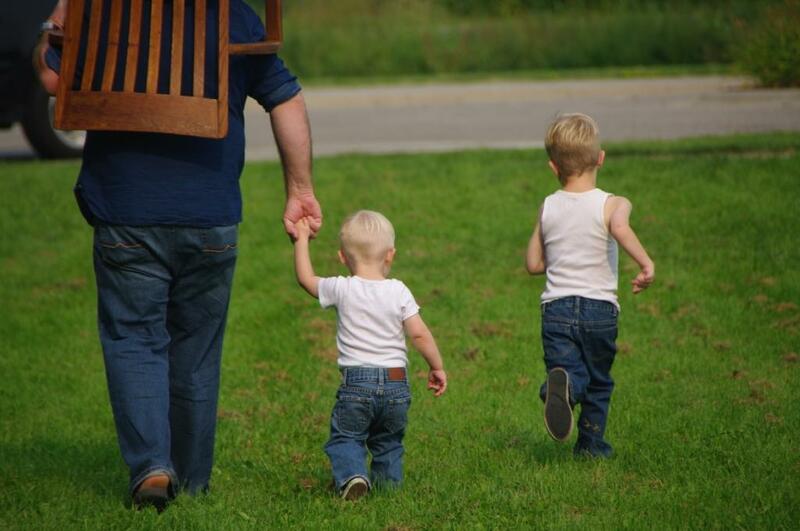 Hopefully, making time to spend with my sons will go a long way to helping them become the very best men, husbands, and fathers they can possibly be.